2001, 2006 and 2011:No party won Panchayat polls!! Gram Panchayat polls are not fought on party symbols, therefore whenever the results arrive, major political parties start claiming victory of their supported candidates in majority of panchayats. This happens in all states where more than one party have some ground. So, when counting for Gujarat’s more than 10,500 gram panchayat polls was on on 31 December, before the counting could reach half mark, Gujarat Congress started claiming that 70% gram panchayats were won by candidates supported by Congress. To gain maximum publicity next day in newspapers, Gujarat Congress called media persons, especially the photographers and TV channels. Crackers were fired for visual treat and state Congress President Shri Arjun Modhwadia was over enthusiastic in telling the media about party’s victory. Interestingly, according to the election commission, the counting had reached just half mark at that time. Judging that Congress party’s victory claim would get publicity in next day’s newspapers, Gujarat BJP too released a statement in the evening that in fact BJP supported candidates had been victorious in 70% gram panchayats. Most of the newspapers next day(1 January) carried a balance story with giving equal space to both parties. Some newspapers published the photographs of Congress party’s cracker bursting event. Some newspapers however skipped publishing such photos. 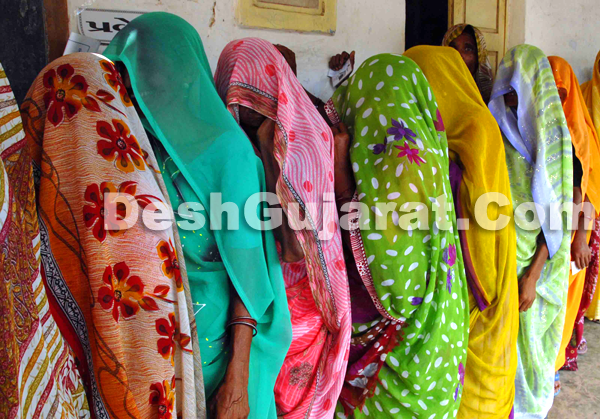 The result the election of more than 10,500 gram panchayats was clear by morning(1 January). However gram panchayat polls are fought without party symbol, and therefore election commission was not in capacity to announce party wise position. Gujarat BJP issued another press release by evening(1 January) and claimed that BJP supported candidates actually were victorious in 75% villages. Next day on 2 January, Gujarat Congress President claimed that by latest estimate, Congress supported candidates actually are victorious in over 75% villages that witnessed panchayat election. On 3 January, Gujarat Congress issued a press release claiming victory of Congress supported candidate in 69% villages (exact figure 6061 villages) that witnessed panchayat election. So why Gujarat BJP is not coming out with an exact figure of village panchayats that it won? Between 1st and 4th January, couple of journalists asked this to state BJP spokesperson IK Jadeja and BJP leader Kaushik Patel, however, Patel replied that information was being gathered, while Jadeja said he will revert. It is expected that none other but Modi can address the issue in his style with some one or two liner in his speech at forthcoming Sadbhavana fast at Mansa or elsewhere. But till the time, Gujarat BJP comes out with specific details of panchayat poll outcome(if they actually come out), Congress cadre should not be over excited with the figures their leaders are catering to them and to media. In Bardoli, Modhwadia claimed that village panchayat verdict shows that ‘Mukhyamantri naa pag talethi dharti khasi rahi chhe’, or in other words ‘Modi is loosing ground’. Modhwadia’s such claim took me to memories of year 2001 when late Congress leader Amarsinh Chaudhary had showed similar optimism based on gram panchayat poll result. After counting of votes completed, Gujarat Congress President Amarsinh Chaudhary and then leader of opposition Naresh Rawal briefed the media that Congress supported candidates had secured victory in 80% villages. They said, rest of the seats were captured by independents and BJP supported candidates. They claimed Congress supported candidates were victorious in 8380 panchayats including 2791 Samras panchayats(where candidates were elected unopposed). Chaudhary and Rawal had claimed that with fresh victory in urban Sabarmati by-election and victory in gram panchayats in rural Gujarat, it becomes clear that Congress party would come to power with 2/3rd majority in year 2002 general election(which was just 12 months away when Chaudhary and Rawal said this). However in successive year, BJP was elected to power with 2/3rd majority in assembly general election. Now come to year 2006, when same 10,000 plus gram panchayats went to poll again. When counting was on, Gujarat Congress claimed victory of Congress supported candidates in 70-80% village panchayats. Gujarat Congress’s then General Secretary Dipak Babaria and Girish Parmar claimed victory of Congress supported candidates in 70-80% village panchayats. They gave break up some of the villages. They claimed that out of 2896 Samras gram panchayats, 2169 were won by Congress supported candidates. Immediately after this then govt spokesperson and minister of Roads and building Shri IK Jadeja issued a press release claiming victory of BJP supported candidates im 75% panchayats. He added that even in Samras gram panchayats 75% were won by BJP supported candidates. Gujarat Congress on that day (December 2006) claimed massive rural support to party and said the party would capture Gujarat assembly next year with clear majority. However just after 12 months, when Gujarat assembly election were over, BJP again came to power with thumping majority of 117 seats out of total 182. So if Gujarat Congress leaders are claiming victory in majority of gram panchayats, just to motivate their cadre, or to keep them in high moral and optimism, or to send a good report to central high command, it is a good strategy, but suppose if their claims are true, even then, with small margin victory of supported candidates(!) in 6,000 villages out of total more than 18,000 villages of Gujarat is not a reason to overjoy. At the same time, for Gujarat BJP, it is easy to collect the data from district units and make a list of victorious panchayats public. But the party has not done so far. It is obvious that questions will be raised therefore over its claims of 75% victory. While summing this up, the question still looms that who won majority of village panchayats? The real answer could be like this. Panchayat polls are never fought on party symbol, and therefore both BJP and Congress are just claiming victory of their ‘supported candidates’. So, Panchayat results should be treated without party tint, and ideally no party should claim victory. Can it be like this? No one won Panchayat polls!